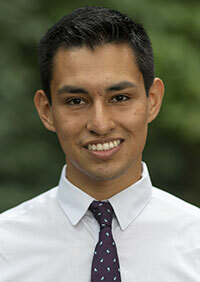 Adilson Gonzalez Morales is a first-generation college student from western Mexico. He earned his bachelor’s degree with double majors in communication studies and multi-language (Spanish; French; German; Russian) from St. Lawrence University in 2016. During his undergraduate career, he traveled to 22 countries through study abroad, research projects, and fellowships programs. Upon graduation, he worked as a legal advocate at a New York City nonprofit providing free legal aid to low-income women with their proceedings in immigration and family law. His experiences in this organization inspired him to develop a better understanding of the social and legal frameworks governing media. Now, as a master’s student at Penn State, he plans to explore the intersection between communication, law, and journalism – focusing on sociopolitical issues such as race, gender, and immigration. Music and sports are a major part of his life. He is a member of the figure skating club.